Tomorrow and the remainder of the week are supposed to be miserable - very hot, very humid - the kind of days that will make me bemoan the fact that I don't have A/C at home. I don't do heat well. I used to have no problems with it, but that was more than 35 years younger and more than 50 pounds lighter. I think if I had less poundage things would be better, but the one thing that has aged with me is my metabolism. So even though I maximize my days by minimal sleep and maximal experience, I can't keep my weight at a reasonable level with minimal maintenance as I used to be able to when I was younger. 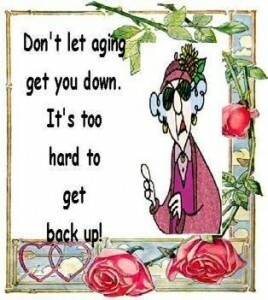 AGING IS NOT FOR THE TIMID! Oh you readers of mine who are younger than my own tickling 60, take that to heart. Nonetheless, I wouldn't give up my experiences and slightly (OK, more than slightly) warped mind and sense of humor for anything. 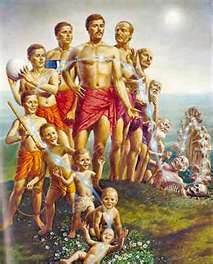 So even though I would want to change my body over to a younger unit, I would want my mind to retain all of the experience and learning that I have accumulated over my years. What was my best decade? My mother always claimed that her 40's were her best years. I had my doubts as I was growing up, but on hindsight, there is a lot to that. By the time forty came around I was established in my home, happily (most of the time) married, I had firm friends (waving to Sharon) and fond memories. I had enough money to not have to worry about every paycheck and bill, and I was able to allow myself to explore my personal creativity more. I think, in my own life, my best years started when I was about 35 and extended through my early 50's. But if I must sacrifice my "beauty" (always questionable at best) for the sake of living my life and experiencing it to the fullest, then so be it! I'll walk my path and be grateful for the opportunity to do so! Blessed Be! My best decade? No clue. :/ But anytime before 1994, I think. The 1990's were pretty good to me too, but the 2000's started out very rough indeed. But I'm still here, toting my sword and hiding behind my shield.